Jose is still a tropical storm but expected to regain strength over the next 24 hours. 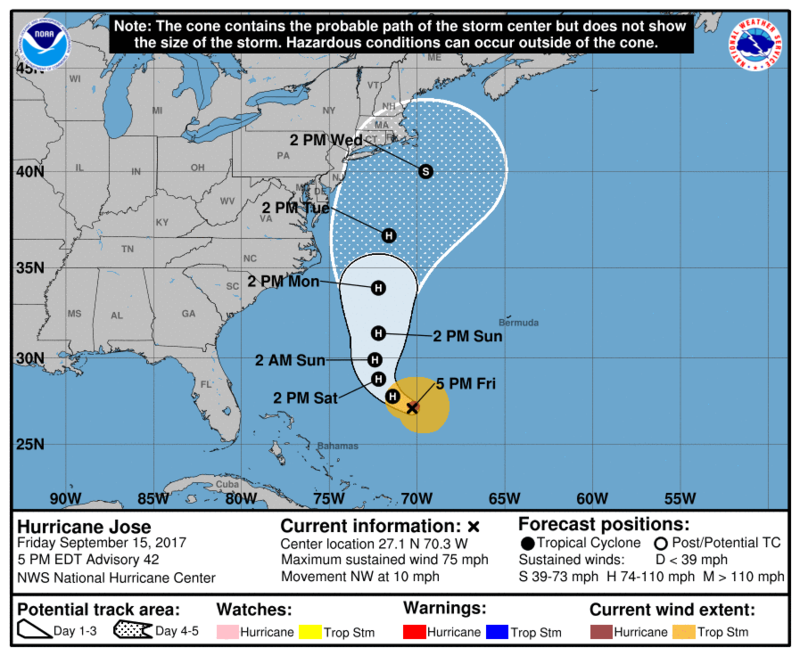 Jose should become a category 1 or 2 hurricane again before threatening the coasts from NC through Massachusetts. You will see above the latest forecast from the National Hurricane Center, regarding the cone of impact. Anywhere in the cone and even on either side could see impacts from Jose. Some areas will have more direct impacts from Irma than others. We will try to outline the threats that would occur in the southeast and give our opinion of where Jose will track in our member update shown below. If you are not a member, then today is a great day to join because we will soon be releasing our winter outlook for 2017-2018. Also, membership prices are 33% off right now. Join today by clicking the link below. For a limited time you can join for 33% off regular rates. Join today and get locked in at this rate…Sign-Up Today By Clicking Below and following the directions!! !